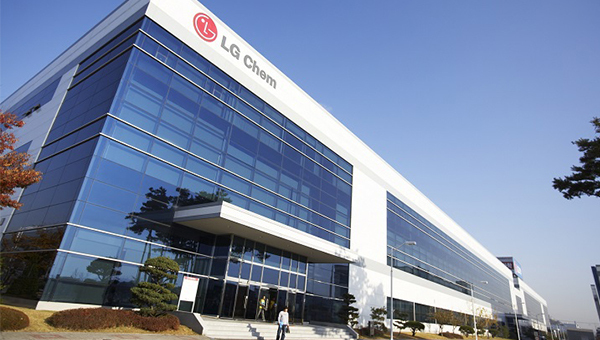 South Korea’s top secondary battery maker LG Chem Ltd. sold a total $1.56 billion in multiple-year green bonds to become the world’s first chemical company to issue notes that specifically target sustainable projects amid climate change. LG Chem said on Tuesday that it issued a total $1.56 billion in green bonds, which is the biggest-ever volume for the relatively new asset class sold by a Korean company. The dollar- and euro-denominated bonds were sold in multiple tranches – $500 million in notes dated 5.5 years, $500 million in 10 years, and 500 million euros in four years. The dollar-denominated bonds with 5.5 year maturity were issued at a fixed coupon rate of 3.279 percent, 0.95 percentage points above the five-year U.S. government bond yield of 2.329 percent, and bonds with 10-year maturity at 3.695 percent, 1.175 percentage point above U.S. 10-year government bond yield of 2.52 percent. The four-year euro-denominated bonds were sold at a coupon rate of 0.599 percent, 0.65 percentage point above Europe’s four-year mid swap rate of minus 0.051 percent. A global green bond is an international bond that is issued in major global financial markets such the U.S., Europe, and Asia. The proceeds are used to fund environmentally-friendly projects such as renewable energy and electric vehicle. LG Chem said it plans to use the proceeds from the green bond sale as an investment fund to supply electric vehicle battery orders. The latest sale has allowed LG Chem to secure foreign currencies at competitive yields compared to that of ordinary bonds and enhance its corporate image as a sustainable, environmentally-friendly company. The company said it raised the debt in favorable condition due to overwhelming demand. It company received the country’s biggest volume of orders worth $10.5 billion as a Korean bond sold in the U.S. and European financial markets. Jeong Ho-young, chief operating officer at LG Chem, said that the successful sale of global green bonds is a result of its continuous efforts and acknowledgement as world’s most competitive player in the electric vehicle battery sector.